The battery powered Bump-Prevent Trimmer provides a close trim with no razor bumps. The impressive cutting lengths of 0.5-4.5mm achieve superior cutting abilities. The sleek black and red trimmer uses a soft touch design making it extra comfortable to use. The precision ground blades optimise cutting performance and delivers excellent results every time. The kit offers everything you need to achieve your look and comes with a base for compact storage. 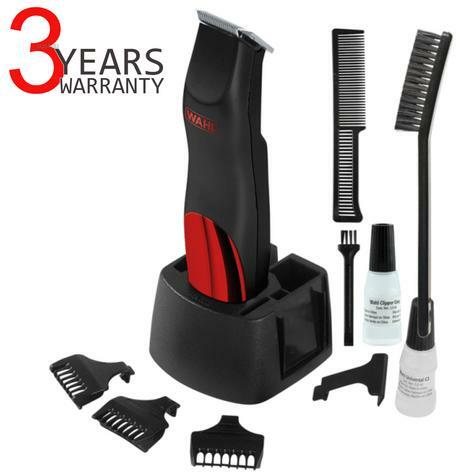 This convenient and easy to use trimmer is battery powered, giving you the freedom of cordless trimming and making it the perfect tool for personal and professional use. This battery powered trimmer runs on 2 AA batteries which are also supplied in the kit. The perfect tool for personal or professional use. The bump prevent trimmer allows you to trim with confidence with its precision ground blade that provides a close, bump free trim every time. Achieve superior cutting abilities with the close cutting lengths ranging from 0.5-4.5mm. This stylish trimmer uses a soft touch design which brings extra comfort for the user.